A novelty advertising system using a plurality of hollow plastic rectangular enclosures simulating stacking boxes of real products to construct an advertising display is herein disclosed. The hollow enclosures provide replaceable advertising inserts depicting the product being sold. Each enclosure is provided with a plurality of interlocking posts and sockets allowing creation of large stable displays without using large quantities of real product which cannot be sold. Such displays can be built with minimal expense while avoiding a danger of toppling displays built with the actual heavy product. I am looking to sell the patent outright. 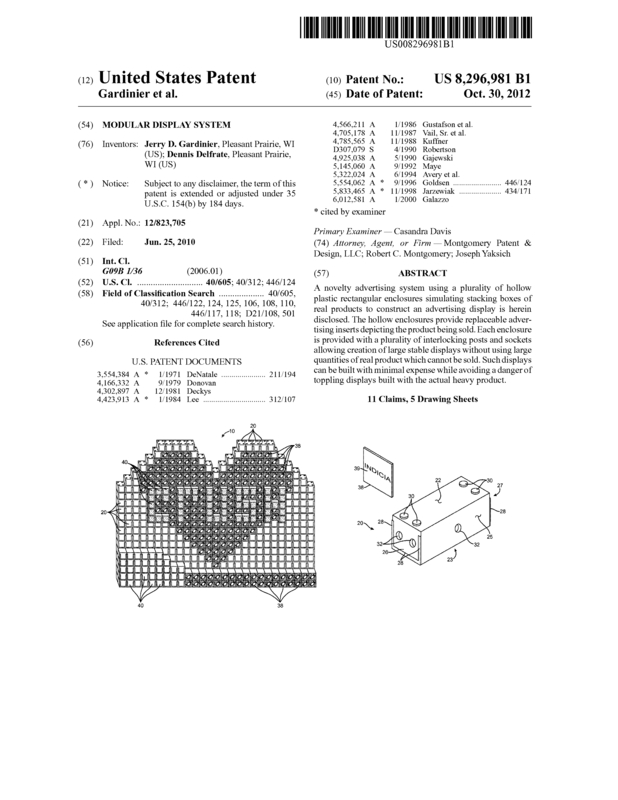 This Patent is a 20 year utility patent for all of the United States. This Patent has never been sold or licensed and has the ability to replace the use of displaying live and perishable products that have to be constantly taken down and replaced before dates expire. That is costly in time and labor. Major Beverage companies are always building big eye catching displays with live and dated products that need to be taken down and replaced with fresh products. The added cost on the Retailer in unsaleable inventory can be eliminated along with the cost of rebuilding these displays.The invention allows you to simply change out labels that depict the product being advertised. With this invention you would be able to promote a new item on one side of the display and another on the other side of the display and never worry about selling through the unsaleable inventory. Please visit the web link to view this invention. Page created at 2019-04-21 18:11:59, Patent Auction Time.